Remorse, repentance and Godly sorrow, are part of the process of maturing in our Christian walk. How many of us have sinned, and the sin changed our trajectory in life? It may have been at school, work, or in a relationship. The Bible says, we all sin and fall short of the glory of God. Fortunately, we live in the New Testament dispensation, and Jesus died to free us from our sins. Does that mean, we no longer sin? No, it means we are no longer bound by our sins. We, in our humanity – can be remorseful about the event. We can repent for our sin. And, most importantly, we can have Godly sorrow about our sin. A few days ago, I was listening to Beth Moore’s audiobook, Praying God’s Prayers, and one of the things that stood out was the distinction between remorse, repentance, and Godly sorrow. My mind (focus) would not leave this topic, I needed to know more and continued to query, what is the difference between the three forms of admission of sin? This is what I learned. Let us begin with remorse, which is defined as a deep and painful regret for wrongdoing. A compunction – a feeling of uneasiness or anxiety by regret for doing wrong or causing pain. Remorse is sadness that primarily focuses on us. We seek forgiveness for our sin, but little more. This type of regret is referred to as worldly sorrow. Worldly sorrow lacks repentance. 10 For the kind of sorrow God wants us to experience leads us away from sin and results in salvation. There’s no regret for that kind of sorrow. But worldly sorrow, which lacks repentance, results in spiritual death.11 Just see what this godly sorrow produced in you! Such earnestness, such concern to clear yourselves, such indignation, such alarm, such longing to see me, such zeal, and such a readiness to punish wrong. You showed that you have done everything necessary to make things right. When we are remorseful for a sin, which is wrongdoing, we are acting in our carnal nature. It is a human response to our wrongdoing. We acknowledge it and seek forgiveness from the person/s that were affected. The focus is our desire for them to forgive us. When we repent, we ask God for forgiveness for the sin or wrongdoing. True repentance offers forgiveness and places the sin in the “sea of forgetfulness’. This refers to God’s forgiveness, and how when we are justified in Christ, God forgets our sins so completely that they may as well be buried at the bottom of the sea. The crux of repentance is that we ask God to forgive us, and He does, but then we revisit the offense meaning, we have not forgiven ourselves. We failed to turn it over to God. If we believe God, we must forgive ourselves and place the offense at the bottom of the sea, or as far as the east is from the west. In short, we can no longer revisit it. 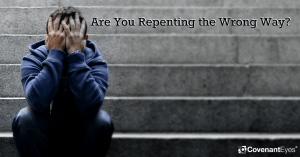 Question – do we change our course when we repent and continue to replay the sin in our minds? No. We have not given up the thought of the sin, though we may have chosen not to repeat it physically, it stills lives deep within us. We asked for God’s mercy but did not accept it. In other words, we turned away from the sin but did not turn to God. Our repentance is incomplete. Our sin nature is still active and has not relinquished the sin. Our remorse and regret remain selfish and self-centered. We cry out for justice to relieve our own pain, but not for the pain we have caused others. 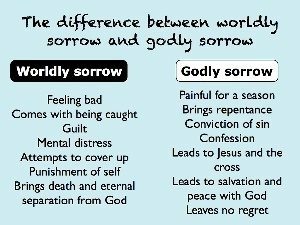 Worldly sorrow produces death because Satan maintains a hold on us through our selfish cries for redemption. This sorrow falls short of Godly sorrow, in fact, it does not exist in the same universe. Godly sorrow is when we grieve for those we hurt when we sinned. It is defined as having grief over the sin, rather than the consequences of the sin. Godly sorrow (deep sorrow) is another element of repentance. Godly sorrow is lying prone before God crying out for His forgiveness. Godly sorrow leads to salvation and leaves no room for regret. As the scripture says, it produces earnestness, indignation, alarm, concern, and an acute sense of sadness as the result of the sin. “Godly sorrow is a kind of wretchedness that can bring the repentant sinner to tears of grief.” (gotQuestions.org). James wrote that “Godly sorrow is the experience of lamenting, grieving, mourning and wailing,” (James 4:8-9). Godly sorrow results from a heartfelt conviction that we have offended God by our sin. When we have Godly sorrow, we resolve within our hearts that we will ‘cease to do evil’ and learn to do good with God’s help. 16 Wash yourselves; make yourselves clean; remove the evil of your deeds from before my eyes; cease to do evil, 17 learn to do good. As we mature as Christians, we move from being remorseful to of asking for repentance and moving into Godly sorrows. Our ultimate goal is to lay our sins before God and plead for his forgiveness and salvation, placing our focus away from the sin and to God. I hope this Post enlightens you, I know the study has provided a greater depth of understanding and has shown me where I have fallen short. I always questioned ‘why’ after repenting did I find myself reliving the sin over and over in my mind. The answer is clear – I did not release the worldly sorrow in exchange for Godly sorrow. The focus remained on me and not on those affected by my sin, or on offending God. I was still reliving the sin in my mind and feeling hurt by the result of the actions, failing to place the focus on others and crying out to God to help those who were hurt. Repentance does not focus on self. Remorse focuses on self. Repentance focuses on those we hurt, and Godly sorrow focuses on having offended God. Godly sorrow leads to salvation. Godly sorrow is sorrow that is often misunderstood and therefore not executed as part of our repentance and turning away from our sin. Having read this, and pondering over replays of sin, can you now upgrade your repentance to Godly sorrow, turn away from the sin once and for all, place it in the sea of forgetfulness, and turn to God?